In 1571 in the Bay of Patras in Greece, the Christians of Europe pushed back and utterly defeated the Muslims pressing north from Africa. Had this Sea battle been lost the whole course of history and the Western World would look very different. We would all be speaking Arabic and worshiping Allah. Pope Pius V called upon all Christians to pray the Rosary and the battle was won even though the Muslims had every advantage. Because of this great victory for the Christian world we have today the Feast of the Most Holy Rosary. Mohammed still wields the sword. 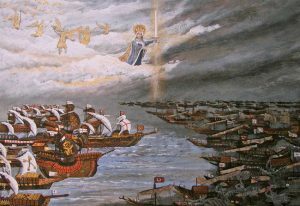 If you’ve never read GK Chesterton’s poem “Lepanto” I highly suggest you read it.